We’d like to wish all our readers a Happy Xmas and New Year! It has been a busy few months with the launch of several new CAPs bringing the total number of active CAPs to 62. We are also hard at work helping partners to put in place plans for 20 new CAPs expected to launch in the first half of 2014. The focus of much new CAP activity is in North East England, which has some of the highest levels of underage drinking in the UK. As of October 2013 Kate Winstanley took over from Philip Loring as full time Director of CAP. We are delighted that Philip is still with CAP in that he will continue to oversee existing schemes in the South East of England for the time being, allowing CAP to benefit from his invaluable expertise and experience. Sport FX teaches young people values such as teamwork, respect and sportsmanship whilst keeping them away from unsupervised activities where alcohol may be consumed. Barnsley CAP reported a 30% reduction of alcohol-related ASB following the introduction of the Sports FX programme. The programme is now being rolled out across South Yorkshire with World Cup referee Howard Webb as a co-ordinator. 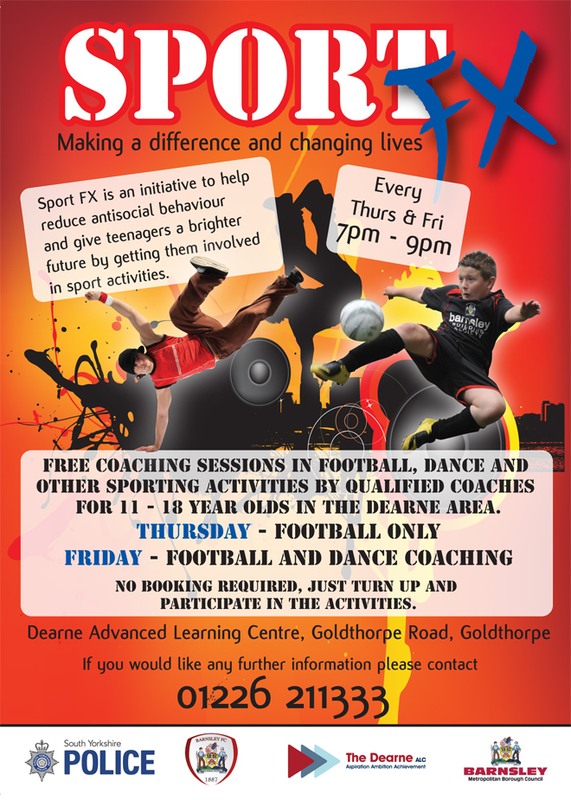 Dearne still offers free weekly football coaching for between 50 and 100 young people at a local school, led by Barnsley Football Club and supported by South Yorkshire Police and CAP partners. Wrekenton High Street and Felling High Street are at the centre of two new Community Alcohol Partnerships (CAPs) which brings to three the number of CAPs in Gateshead. The Wrekenton CAP launched on 17th November and the Felling (East Gateshead) on 27 November – both CAPs are being co-ordinated by Gateshead Council with active participation from local retailers, The Gateshead Housing Company, Tyne & Wear Fire and Rescue, NHS and Northumbria Police. The partnership aims to reduce the availability of alcohol to underage drinkers through working more closely with shops and educating young people about the dangers. The photo shows Alan Simpson pictured outside the Co-op at the Wrekenton launch alongside representatives from Gateshead Council, Northumbria Police and staff from The Co-op who are providing training for other licensed outlets in the area. A new CAP was launched in Gravesham on 19th September - the launch was marked by a public awareness event outside the Co-Op store in Perry Street Gravesend. The Gravesham Safe Awareness unit was used as the centre price from where members of the team spoke to local shoppers about the issues and dangers of underage drinking and proxy purchasing. Local residents passing by were able to ask questions and participate in a survey covering alcohol issues in the local area. At the same time licensing and trading standards officers visited all stores in the locality to advise them about the CAP and to offer them support. The team were also able to engage with young people from the local schools as they came to buy food from shops in the parade during their lunch break. The team will be making regular visits to the area to support stores enforcing reinforce the CAP under 25 ID programme and will also be present at local schools parents evenings in October. Behnam Khazaeli was presented with a CAP Excellence Award on 5 December for his outstanding contribution to a number of CAP schemes in the North East. This photo shows Alan Simpson presenting him with his award in front of the original scale model of the Angel of the North. Behnam has been the driving force behind the Birtley, Wrekenton and East Gateshead CAPs. Schools in 20 CAP areas are using the Alcohol Education Trust (AET) “Talk about Alcohol” secondary school programme. The AET published its long awaited evaluation report on 31 October 2013 and held an event at the House of Commons to present the results. The evaluation showed that the 'Talk about Alcohol' programme has resulted in a statistically significant delay in the uptake of first whole alcoholic drink, an improvement in knowledge and improved engagement with alcohol education among the 2,000 pupils in the intervention group when compared with the 2,000 pupils in the carefully matched control group who were followed up 2011-13. The programme has been endorsed with a 3/3 ranking for the programme's effectiveness and the evaluation with a 5/6 score for evaluation quality by the Department for Education appointed CAYT, both of which are excellent scores. CAP will use the results to encourage greater uptake of AET resources in CAP areas that are currently not using ‘Talk about Alcohol’. The excellent “Just a few drinks” film series, which is part of the “Talk about Alcohol” programme and shows the real life drinking experiences of four teenagers, was awarded a BAFTA in November 2013. You can view these at BBC Learning 'Just a few Drinks' film clips. The film series were produced by Evans Woolfe Media. Partners in Derry held an excellent youth conference involving most of the secondary schools in the city over four days. Two schools attended on each day and pupils were invited to participate in six sessions over the day run by partners focusing on different aspects of alcohol including; its effect on communities, alcohol and the law and addiction. Youth services used the event to consult with young people on the development of an app providing details of activities and each group were able to spend some time using the portable sports cage and dome to play ball games. Alongside the more formal sessions, pupils visited an ‘alcohol museum’ comprising a series of interactive stalls, some involving actors, to enable them to explore different themes around alcohol. The event was co-ordinated by Drink Think and involved the police, youth services, community wardens, council sports service and drug and alcohol charity Divert. On 19 December Hayling College was presented with a CAP Excellence Award for their significant contribution as a key partner in the delivery of the Hayling Island CAP. The Hayling CAP is acknowledged as the major contributing factor in a 41% decrease in anti-social behaviour together with a reduction in reports of under 18's drinking in public and Hayling College was the heart of the project, with Helen Cox, head of lower school, and Ian Mills, head of upper school, providing fantastic energy and support. Councillor Linda Dunford, Chair of the Midsomer Norton CAP was amongst the recipients who received ‘PCC Pride Awards’ by Avon and Somerset Police and Crime Commissioner (PCC) Sue Mountstevens at a ceremony on Thursday, November 28. PCC Pride Awards were presented to 11 winners who attended the ceremony and a further three certificates were awarded to volunteers who received highly commended at the recent Neighbourhood Policing Awards. Nominees were invited to Police Headquarters, Portishead where they were presented with a certificate by the Commissioner before having lunch with Sue and Chief Constable Nick Gargan. Avon and Somerset Police and Crime Commissioner Sue Mountstevens said: “These awards are to recognise the silent stars of our communities that achieve great things or go above and beyond what is expected of them. Cllr Dunford was described as ‘a very strong and positive role model for members in the community’ who was said to have ‘demonstrated time and again that a positive and determined attitude and a desire and passion to change things for the better can make a real difference’. A 21% reduction in violent crimes, an 81% reduction in criminal damage and a 100% reduction in ambulance call outs in the last four months to the town centre was cited as evidence to show the success. Shropshire Youth ran a successful gardening project involving young people working to improve older people's gardens. The scheme generated great feedback from all involved; plans are now in place to involve young people in the ‘In Bloom’ competition. Local Councillors have been invited to go out with workers from Shropshire Youth to see the detached youth work. Treacle is an established multi-agency operation that runs every Halloween period in Wigan looking at alcohol issues in general. This year partners worked in conjunction with the fire service to hold successful new diversionary activities for young people over the bonfire night/Halloween period. A proxy purchase awareness raising campaign evening was also organised by Crewe CAP to coincide with Hallowe’en and bonfire night. Partners, including retailers, gave out leaflets and provided educational messages throughout the evening.